NETWORK UPDATE: ONCE UPON A TIME and THE GOOD WIFE each gained 0.1 in final numbers. The latter tied GOOD WIFE with MADAM SECRETARY at 1.5, and gave GOOD WIFE a convincing win over REVENGE when they went head-to-head at 10PM (not that it’s hard to have a convincing win over REVENGE). 60 MINUTES lost 0.1. In addition, WORLD SERIES GAME 5 adjusted to 3.3, and SUNDAY NIGHT FOOTBALL adjusted to 7.1. THE WALKING DEAD (AMC) lost a bit of its bite, down 0.74 to 6.97, although that was more than enough by several leagues to dominate the rest of Sunday cable. 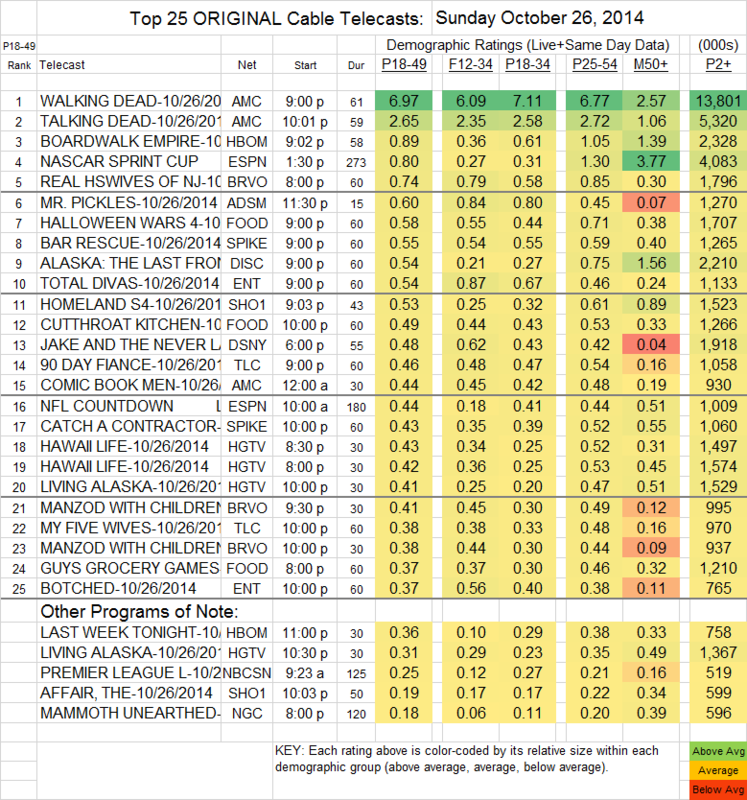 Interestingly, despite the WALKING DEAD drop, TALKING DEAD was actually up 0.03 to 2.65, but COMIC BOOK MEN fell 0.11 to 0.44. 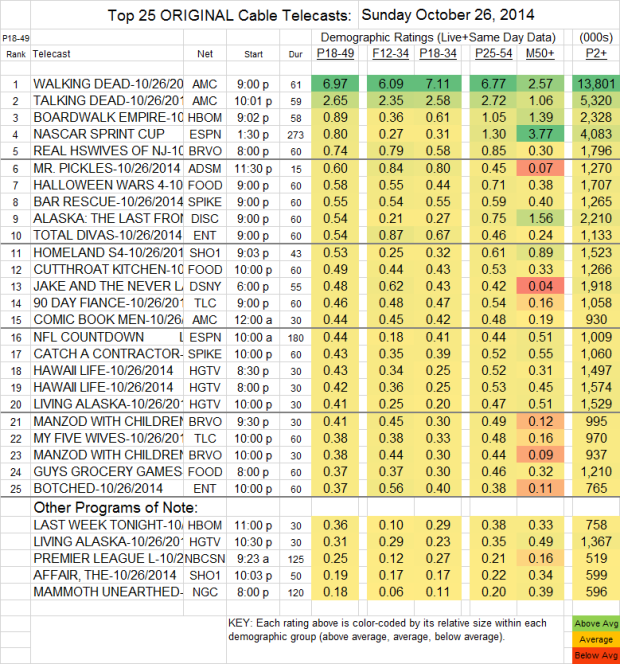 The series finale of BOARDWALK EMPIRE (HBO) got a 0.09 bump to 0.89, and LAST WEEK TONIGHT gained 0.07 to 0.36. On Showtime, HOMELAND was up 0.06 to 0.53, and THE AFFAIR rose 0.04 to 0.19. REAL HOUSEWIVES OF NEW JERSEY (Bravo) tumbled, down 0.35 to 0.74, although MANZOD WITH CHILDREN was down only 0.05 to 0.38. MR. PICKLES (Adult Swim) lost 0.07 to 0.60. ALASKA: THE LAST FRONTIER (Discovery) remained at 0.54.